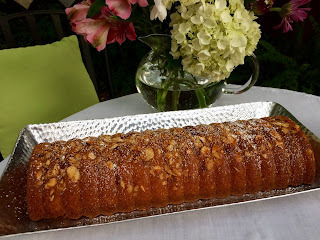 It was awhile back that I read about this fabulous sounding Almond Cake on Susan's blog, Savoring Time in the Kitchen. I knew that I wanted to make it and even ordered the Rehrucken cake pan from Amazon., which describes the cake as one that is enjoyed in Germany and Austria. I finally got around to making it, and oh, is it ever tasty. You can read about it on Susan's post here. One of my friends let me borrow her Norske Nook Book of Pies and Other Recipes, and the Almond Cake recipe was in it, also. However, in the Norske Nook cookbook the baking time for the cake was 1 hour and 15 minutes, which in my opinion, would be way over baked! I thought I'd use some pretty, summery teacups for my tea, in honor of the pretty cake. 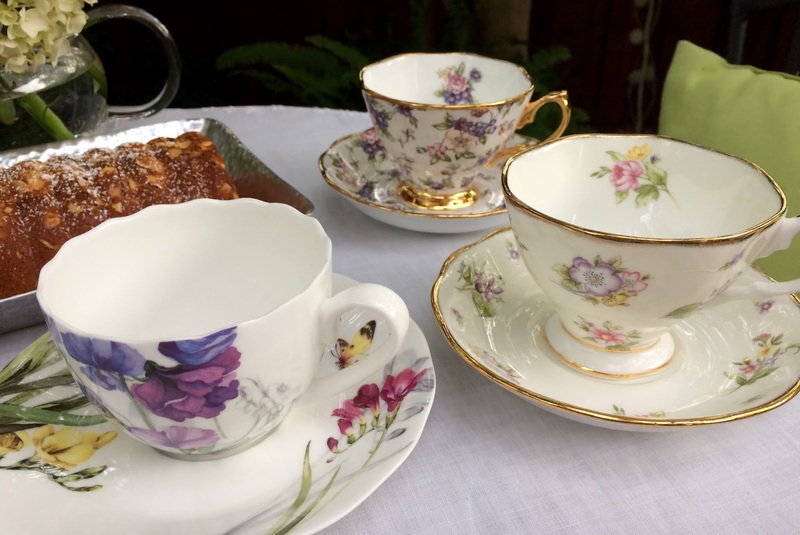 The two on the right are Royal Albert ones gifted to me in a set of five from my youngest son and DIL, and the one on the left is a Gracie teacup from a dear blogging friend. I love rotating my teacups so that they all get used and loved. None of the flowers came from my garden, but came from the bargain section at Kroger's, which was a tip from my daughter! I left out the vanilla and doubled the almond extract because I wanted a pronounced almond flavor to the cake. If you prefer, use 3/4 teaspoon vanilla and 3/4 teaspoon of almond. Toast almonds on a small baking sheet in a 350 degree oven for approximately 5-7 minutes, watching carefully so they don't burn. Beat together sugar, egg, extract and heavy cream, (or milk). Sift together flour, baking powder and salt and add to mixture. Fold in melted butter and blend until smooth. Prepare the Rehrucken pan by spraying with non-stick baking spray (I used Baker's Joy). Place toasted sliced almonds in bottom of prepared pan and then pour in batter. Bake at 350F degrees for about 40 minutes (my cake took 50 minutes). A toothpick inserted in the middle should come out clean and the cake should be brown around the edges. Cool cake in pan for 30 minutes and then place a serving plate on top of the cake pan and invert to release the cake. 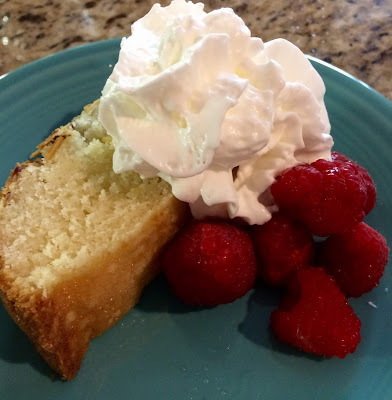 The cake can be sprinkled with powdered sugar, served with fresh berries, and whipped cream, or sliced through the middle and filled with whipped cream. This cake is so tasty! Delicious!! 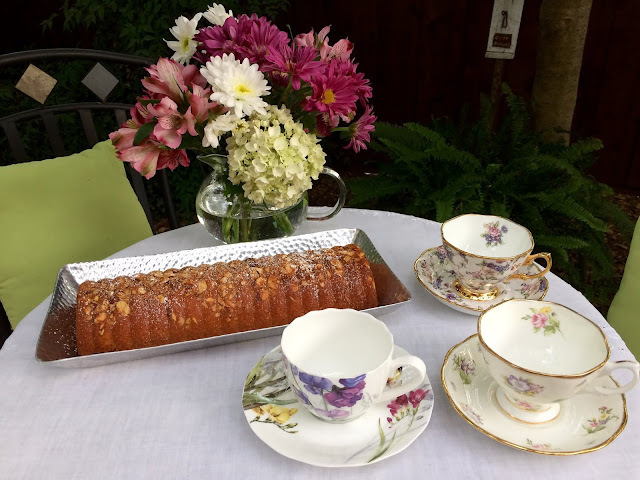 How I would love a piece of that Almond Cake and a cup of tea in that pretty Gracie teacup. Love all those pretty flowers on the cup. Pinned! That looks so delicious! Such a lovely table Kitty. A good tip from your daughter about the flowers at Kroger's, thanks. I want to bake this cake too so I'm definitely saving this recipe. It sounds and looks delicious. I will use all almond flavoring too. A great recipe for sharing, thank you and Susan. I love almonds, so I can only imagine how delicious this cake is! It looks so moist! Thank you for sharing, sweet friend. Sending love and hugs your way! What a delicious looking cake and anything with almonds just has to be good! Beautiful teacups! I hope you are having a blessed week! Kitty, your cake looks wonderful! I think the whipped cream and strawberries make it look especially good. All your teacups are so pretty but I think I would choose the one on the far right for my tea. :-) Hope you are having a gorgeous day, dear friend. That sounds absolutely, positivity yummy!! I'm thinking I too must purchase one of those baking pans and give this a try. I LOVE the flavor of almond in baked goods, even my pancakes. Thank you for the tip on the timing of baking. Your tea cups are always a lovely added touch to your posts. I like this recipe! It doesn't seem that it will be overly sweet, and we do like almonds. Thanks so much, Kitty! This looks so beautiful and turned out so perfect. Please pass a piece! Your recipe is definitely getting printed out here. Thanks for sharing and the extra tips! My mouth always waters when I visit with you. I bet this is delicious -- I love almonds and almond flavoring. Your teacups are beautiful. How delightful!Your cake looks yummy and I love your pretty teacups!Hugs! Kitty, I really want to try your recipe. I have fond memories of attending Scott's Antique Show in Atlanta some years ago and buying almond cake from a greek vendor. It was delicious. I would be so happy to duplicate the delicious cake recipe to enjoy. I look forward to trying your recipe. Sounds yummy. I think I would do 1/2 almond and 1/2 vanilla. It is a perfect loaf for a tea party. Kitty, your cake is lovely and sounds delicious. So perfect with the berries and cream and a nice cup of tea! Oh dear Kitty, what a wonderful looking cake ! It really sounds yummy. Thank you for the recipe sweet friend. This cake looks and sounds so scrumptious, almond flavoring always adds so much to a cake. Thanks for sharing. What a lovely cake and it looks delicious. A perfect cake for afternoon tea! Hope you are having a great week and thanks so much for sharing your post with us at Full Plate Thursday! It looks like a perfect summer treat. Thanks for linking to Keep in Touch. I love almond flavoring and this cake sounds so delicious! Thanks for sharing the recipe with SYC. Love your teacups as well.